← Liwa’a Zulfiqar: Birth of A New Shia Militia in Syria? IF YOU LIVE IN THE JURISDICTION OF CANADA, AUSTRALIA OR UK PLEASE BRING THIS TO THE ATTENTION OF YOUR COUNTRY’S NATIONAL SECURITY AND/OR INTELLIGENCE UNIT. 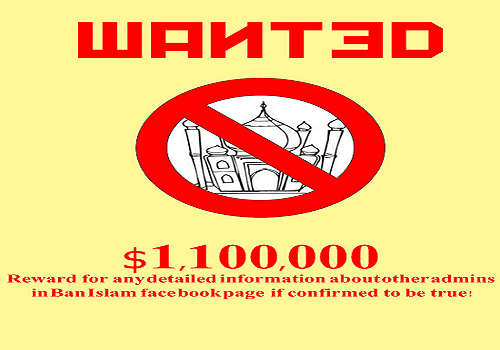 One of the promise for a $1,100,000 reward for information on the admin of Ban Islam facebook page. But where would the money come from? I think we have found the source…. ONE: Professor Adel Sharif is apparently the founder of the Islamic Socialist Network (I.S.N.) which posted a bounty on the head of counter-jihad bloggers and facebook users. Sharif works in chemical and water engineering. One of the senior members of his ISN Amir Hossein Raisolsadat has been bragging his desire to ‘kill infidels’ with nerve gas and massacre on his facebook account. TWO: Virulent hate and to extremism is displayed from Malek Asad’s facebook page where he admiringly compares Hitler to Osama bin Laden and provides a quiz as to who the next terrorist is.Malek Asad, Australia, has made it his goal in life to threaten everyone in the counterjihad world with chemical warfare, decapitation, and more. Officially he claims he is not a Muslim but he administers a page called “Islamic National Socialism” and made its logo his Facebook profile picture. THREE: Amir Hossein Raisolsadat from Canada is another nefarious Muslim living in the West, who dreams of murdering ‘infidels’ with nerve agents. As usual Raisolsadat pretends to not be Muslim while promising that biological weapons are being prepared to kill ‘infidels’ and their children. Raisolsadat runs a blog called AHRLS Pesticides which contained all his contact details, and quickly changed once his identity was discovered. The question is WHO would give them this kind of money to find and locate a person and their address they apparently want to kill? And WHERE would so much money come from, which apparently reach above $2.5 million. The post contains an image with a logo showing terrorists with weapons, dead woman with a child, soldiers and a police officer spraying teargays on a crowd of civilians. Australian-Canadian MuslimAmir Hossein Raisolsadatis estimated to be in his early 20′s and, from the looks of his Facebook page (now removed), he hates the west and wants to massacre infidels with nerve gas. This entry was posted in Uncategorized and tagged Canada, Director of National Intelligence, Director of the Central Intelligence Agency, HOME LAND SECURITY, National Counterterrorism Center. Bookmark the permalink.